AiM works on how you move when walking. There many people who have problems with their bodies breaking down during exercise or even just under the conditions of ordinary life. When this happens it may be that simple muscular core strength is not enough to solve the patient’s problem. 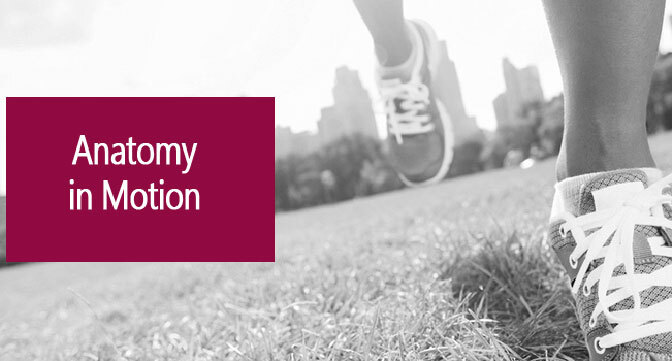 Anatomy in Motion (AiM) proposes an alternative movement-based solution based on improving gait. AiM looks at the alignment and posture of the person in movement when walking. It then seeks to add in the part of the patient’s movement which is missing or improve that part which is inadequate. As well as alignment in movement, Anatomy in Motion is particularly concerned with the “rebound” potential of the human body. If you think of throwing a ball, before the throw, one’s body has to “wind-up” first. If there is no wind-up, the throw will be weak, regardless of how strong the muscles are. So, if you want to throw further, you need to wind-up effectively. A very ineffective strategy which would make little or no difference to one’s throw would be to make the chest and arm muscles bigger, for example working on bench-press. This means that much of what passes for exercise is a waste of time. Real movement starts with a wind-up, a lengthening movement. AiM applies this idea of exercise to gait. There is a wind-up phase of gait when the big backside muscle gluteus maximus is lengthened. Simultaneously, there is an accelerative shortening phase when the other gluteus maximums is shortened and the rear leg pushes off. This then is the simplest analysis of gait. Do you have a good enough wind-up? Do you have a good enough push-off? Of these two, the push-off, the shortening or “concentric” phase, is easiest to see, understand, explain and feel from the inside and correct. The wind-up, lengthening, eccentric stage is much harder to see and understand. Yet it is the crucial stage. The majority of the exercises in AiM are of the lengthening, eccentric type. In other words, they are focussed on the wind-up. In this approach Anatomy in Motion is highly unusual if not in fact unique. The overwhelming majority of exercise systems focus on the concentric, shortening phase. Think of abdominal crunches or of pull-ups or of bench press. In this AiM seems entirely at odds with the whole exercise world. When one learns one’s muscles, one learns how the muscle contracts. In Anatomy in Motion the focus is exactly the opposite way round. The question is how does the muscle lengthen, decelerate, or, in other words, wind-up? Welcome to the eccentric world! A very confusing place to be on first experience. At the practical level, AiM is much easier to do than it is to explain. Typically the patient will have 5-10 minutes a day at home working on recovering or developing a particular aspect of movement. Lastly, it should be mentioned that there is no independent scientific evaluation of the methods of AiM. This is partly because AiM is very new. Until such an evaluation takes places, all we have are individual case studies and anecdotal information. The word of mouth on Anatomy in Motion is very positive. Chiropractor Andrew Hunter decided to train in Anatomy in Motion and offer this service to patients because of his own experience with a knee problem which AiM was able to help and which no other therapy or system seemed able to fix.